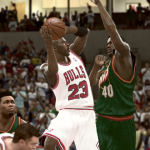 A few weeks ago, I ran a series of Wayback Wednesday articles documenting my attempt to complete the Jordan Challenge in NBA 2K11. I was ultimately successful, taking care of my unfinished business and unlocking MJ: Creating a Legend without resorting to the cheat code. Despite some frustrating moments, I ultimately enjoyed the experience, and felt a sense of accomplishment when I finally completed all ten challenges. While playing through the Jordan Challenge, I captured several videos of moments that I really enjoyed. I didn’t want those clips to go to waste, so I’ve put together a highlight reel from the seven challenges I went back and completed for the feature. Check it out below, or catch it here on our YouTube channel if you can’t see the embedded video. In case you’re wondering, the music is from NBA Live 99, which seemed appropriate given that the game came out the year of Michael Jordan’s second retirement. I hope that you enjoyed the reel; stay tuned for more throwback content, each and every Wednesday here at the NLSC!